Levels. When it comes to listening to music, a 'gift' of sorts that reviewing so much of it has given me over the years is the seemingly unyielding desire to qualify and quantify it in some way. I rarely ever hear anything without somewhat immediately casting it in some type of category in regards to exactly how much I enjoy it at the time. It almost gives me some kind of reference point should I need to go back to it and, even if I am wrong and change my mind (which does tend to happen, although less and less as I get older) at some point in the future, calling it something, whatever it may be, has given me a platform and a foundation to examine that shift - which is always very fascinating (more on that later) (…if I write this correctly) (…and I might not) (…and if I didn't I probably took this part out). And if you read my material to any degree you are certainly familiar with the fine dust and powder that I attempt to grind things down to, so if I am really tuned into something I can go on and on about how I LOVED a certain tune, besides the second verse or the intro or something obscure like that and because I am a giant nerd, I find experiences such as that to be infinitely exciting. Obviously at the head of something like that is when you find an artist, or an album, or a song, or a verse, or a performance which registers with you as something which you hold in the absolute highest esteem for one reason or another. It becomes a favourite of yours and, though it may sound strange, you essentially fall in love and it is a beautiful, beautiful thing. So with that being said, I can fully declare myself to be in a musical love with the work of Vaughn Benjamin/Akae Beka/Midnite - another gift given to me likely primarily by aging. In the context of what I am writing about today, Benjamin's work is basically flawless. Because of the way in which I receive his music, he always gives me something which rates highly and, as I have said in the past, it is the journey to comprehension. I LOVE to listen to his music and, whether I find myself initially amazed by what I hear is of less importance than for most others because I know that when I begin to take a deeper listen, I may hear something totally different. The result of that, because of his prolificacy, is this winding memory I have of songs and full albums in some cases (one in particular recently) which're either fully fantastic or have enough lyrical 'flares' of brilliance that they stand out, in sections, as just as strong. And, like I said, sometimes those sections begin to merge and what happens is that my "desire to qualify and quantify" gets a rewind of a significant degree and I reach this moment of wondering "… wait, was it THIS good all of the time?!!". The prevailing allusion here is to an album which may just be my favourite album Vaughn Benjamin has ever done and is one which went through this same process, 2014's pretty much perfect "Beauty For Ashes". I don't know if I've ever heard an album so lyrically PROFICIENT. It sits at the same table as "Black Woman & Child" and maybe one or two others (that would be a fun list to do at some point). It was without worded flaw and it took me months to see it and I'm still working on it and likely will be, in some way, for the rest of my life. Now, "Beauty For Ashes" was one side of that phenomenon where something just continued to pick up steam and pick up steam to the point where it has risen so highly that I have to say that I've changed my mind on it so thoroughly - having gone from 'good' or 'very good' to some type of 'great'. What we have today, on the other hand, is something which I'd be absolutely shocked to see go through a similar process because it simply doesn't have the same 'starting line'… at least I don't think it does. 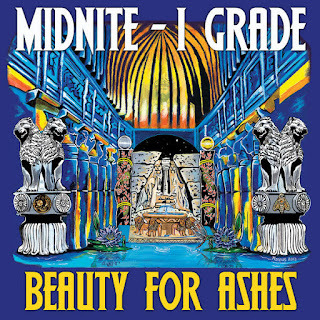 It just so happens that helming the mighty "Beauty For Ashes" set was I Grade Records along with the Zion I Kings. If I've fallen in love with the music of Akae Beka, I've managed to do so on an even higher scale when it comes channeled through the ZIK. Their albums tend to be able to consistently locate and identify this wonderful groove where Benjamin's towering WORD is presented with a just as powerful and attractive melody. They're also very well presented, in general and it is always clear that someone has taken their time to ensure that the work is received by fans as best as it possibly can be. THANKS! The same could be said for both Midnite/Akae Beka sets since "Beauty For Ashes", 2014's instant chaser "Ride Tru" and "Portals" from earlier this year - AND now the all kinds of curious "Livicated". Unlike both "Ride Tru" and "Portals", "Livicated" comes to us via the 'Z' of the ZIK, Zion High Productions. I was actually surprised to read on the release that this album was the debut of Akae Beka/Midnite on ZHP. It seems like something that would have happened throughout the years at some point before 2016. There have been a steady stream of releases through IGR and even a pair for 'K', the Lustre Kings Productions (biggup LKP), "Infinite Quality" and its dubbed out counterpart, but "Livicated" marks the very first union of Akae Beka and Zion High Productions. It, of course, isn't the very first piece of work AT ALL yielded by the pair as Vaughn Benjamin has appeared on previous ZHP official releases. Most recently was just a few months ago as 'Described Peculiar' (which is peculiarly absent from this album) appeared on the Marketplace Riddim (which you already own), there was also 'This World Happened' from the Jah Warriah Riddim in 2014 and Benjamin also blessed the wonderful "Therapeutic" from Ziggi Recado (also known as Ivan The Terrible these days) that same year. And, again, having been prevalent and ultra-present in the run of the Zion I Kings, it seems like this had already happened, but surely has come in its proper time when you listen to the full album. I also feel inclined to mention that, over the past few years, whether you've realized it or not (and if you're reading this far into a review (which technically hasn't even begun yet -- that's the next paragraph -- ) you probably have) Zion High Productions has been on a TEAR in recent years. Works like "Livicated" and "Therapeutic" and the riddim albums and others coming from the likes of General Jah Mikey, Glen Washington ["Let your blessings fall on me"] [WHAT!} [BOOM! ], Cornel Campbell, Mr. Lloyd Brown and who knows what I am forgetting -- I DO! -- "Jah Golden Throne"! All of that, for me, stands out as one of the most reliable outfits in the entire genre and, even on paper, combining that with Akae Beka is potentially special. So therefore, perhaps it shouldn't be very surprising to me at all that when I dug into "Livicated", I walked away with one dominant question, "is this album really THIS good?". Yeah. Yeah I think it might be. First of all (all of that I've just written and I'm saying stuff like "first of all"} [HUH?! ], I absolutely must mention what is going on with this album musically. There is something truly special going on with the sonics of "Livicated". It sounds fantastic from beginning to end and a major credited goes to the players of instruments who helped make it so (which includes, if I read correctly, Yami Bolo, who has clearly stuck around ZHP and I'm still hoping that someday artist and label can come back together and provide the world with a follow-up to their dominant "Rebelution" set, one of my personal favourite albums of all time). Strictly in that regards, it is certainly one of the finest Akae Beka/Midnite albums to date in my opinion and that is the case even before we get to the worded-work of Vaughn Benjamin. 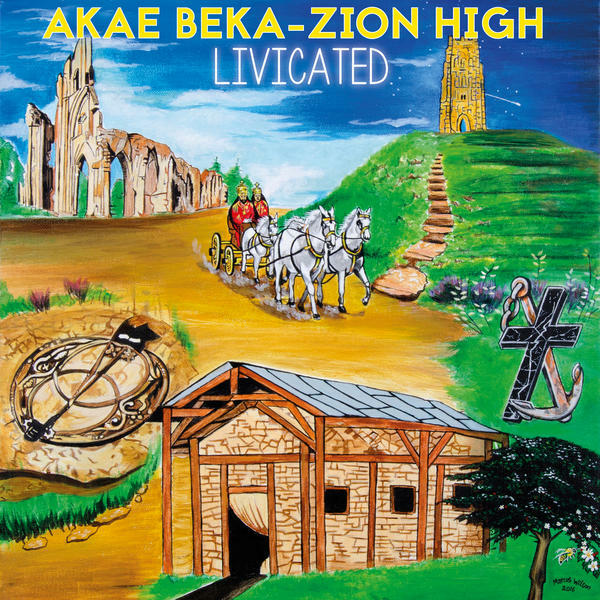 That work begins on the new album from Akae Beka, "Livicated", through the apparently already very well received 'Firmness'. The best way for me to describe the opener here is to call it COMPELLING. There is so much going on here in terms of the mood of the song -- where we have this seemingly ultra-focused and tuned in Benjamin -- across this SWEET composition. The result is a lyrical tirade which borders at times on the levels of infamous SCORCHERS such as 'The Gad' and 'Sha-Tee' in my opinion. What I ultimately take from 'Firmness' is that it is a composition regarding the indomitable will of [some] men and everything that we have been through, collectively, and the FORCE which has enabled us to remain so durable. This song, again, is aided in being so damn convincing because of its vibes - it literally stands up and glows on an album which eventually shows that it shines brightly in any way you look at it. We can also say the same of the second track on the album, the all kinds of curious 'Usward'. This one was SO much fun to work through from the direction of attempting to get to its meaning. Where I am with it now is that Benjamin is saying how important it is for us to do things and to live lives which are favourable and appeasing to His Majesty. He goes on to outline how easy and commonplace it is for us to be able to lose this route ["They saw confusion reign. Incomprehension, rule and shame. They saw anger, pride - and flame"] and, by extension, he also deals with the relationship between The Almighty and man. It is a fascinating tune and I'll be very interested to see how the masses react to it. ALSO, be very observant here of the music, which BEAUTIFULLY continues more than half a minute after the song's final lyrics (and biggup a Andrew "Drew Keys" Stoch for a scintillating horn there, if I read correctly) (…and I usually don't) (but big him up anyway because he HAS done a great deal of work throughout "Livicated"). Rounding out the first quarter of the album is another of its definitive highlights to my ears, 'Discreet'. Despite being the shortest offering you'll find here by nearly a minute, 'Discreet' is definitely a FULL musical experience. AND SHE KNOWS LOVE WILL BIND THEM"
To my (surely incorrect) ears, this is a tune about enlistment and positivity. I can say that about songs from just about any artist and you can, essentially, fill in the lyrics (even if the song is really good), but when you place such a moment in the hands of Vaughn Benjamin, what you end up with is a composition which flows in so many different powerful and colourful directions, that is certain to draw so many different listeners in each one of them. And though you'll get tired of me saying if you aren't already (get over it) (or don't, I don't care, it's not like I'm going to stop doing it) the music on 'Discreet' is exquisite! The effort "Livicated" is named after is another one which has delightfully occupied quite a bit of my time in listening to this album. First of all is the music (I told you I didn't care) (AT ALL! ): The merging of vocals and riddim here works surprisingly well and not just because of what is being said. It actually has a good pacing and melody to it which aren't things that normally jump out at me when it comes to the music of Vaughn Benjamin, who may be LESS dependent on actual music than any musician I've ever heard in my entire life: He pretty much just does whatever he wants. As for what he does actually say on the piece, 'Livicated' is a glorious tribute to His Majesty. I would think that the idea would be to hold the entire album as such a tribute and Benjamin does, subsequently, go on to identify his music, in the broad sense, as being just that: He makes music to glorify The Most High - but you didn't need me to tell you that. And then there's the BOOM! Make the prophecy come to realization"
The finest piece of music I've found on this album was and remains the simply MASSIVE 'Daughtaz & Sunz' which, to my opinion, is a call of unity and to unify followers of Rastafari throughout the world ["Out of every nationality they come. Every foreign language, every denomination. Every background, creed, every occupation"] and just how important he feels it is that all stands up and are present and accounted for. Got the Satan on the run and umm"
Furthermore (and again), Benjamin goes on to make the connection that this is pleasing to The Almighty ["Treasured by The Lord is daughters and sons"]. The vibes on this one are just so powerfully SIMPLE that it is infectious as well. 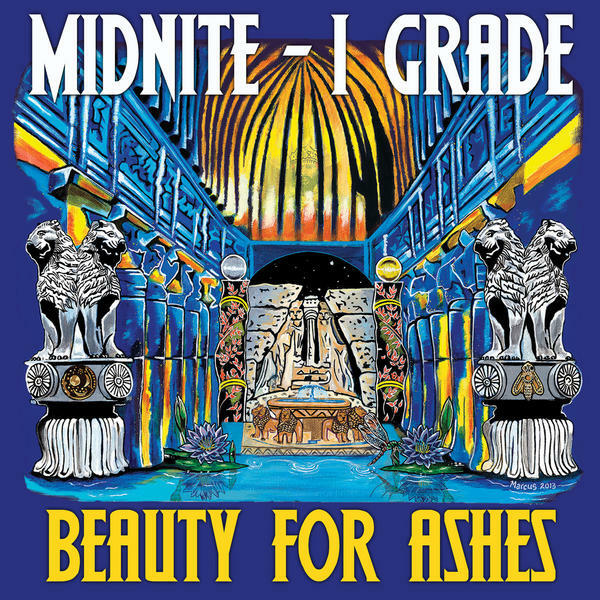 There's nothing which is going to leap out at listeners here, alone, but when you put everything together and pack it in front of a riddim which is a serene piece of brilliance, what you have is likely one of the best Akae Beka/Midnite songs that I have ever heard. I should also mention that this musical bit of candy also extends pass the final spoken words on the tune and down that stretch, which represents the album's longest track, it dazzles and is not to be missed (there is an ever-present sound on this riddim, I don't know what instrument makes it, maybe a guitar, but it is SOOOOOOOOOO NICE to hear!). You'll also be making a giant mistake should you not keep an eye and an ear on the next selection on "Livicated", 'Loose The Gates'. This golden drop takes a technological view of the world and isn't entirely dissimilar from routes traveled by Akae Beka in the past (most memorably would probably be 'All I's On You' from the aforementioned "Beauty For Ashes" set). I don't come away from ideas like this one thinking that it is the intent or attempt of Vaughn Benjamin to entirely eschew or usurp technology and the furthering of technology as a whole, but I think what he is saying is that it is VERY easy to lose oneself down that road and that there're many negative aspects of technology, and those commanding it, continuing to grow its seemingly never ending reach. Ultimately I think he speaks of caution and to be careful on yet another standout on this project. While the second half of "Livicated" may well offer a slightly more diverse and 'curious' sound than its first, it instantly proves itself to be on the same level and, perhaps at times, even higher. A nice example would be the lullaby-like 'Lifetime'. I don't know this for sure, I have no inside information (and I'm probably wrong anyway) but, as a father of two, my ears have identified this song as one inspired by the blessing of having children. Maybe it is just for me, but Benjamin appears to deal with the JOY and the proverbial ups and downs of parenthood and how it is the most imperfect of all world practices and the grandest of responsibility at the same time. It is a lovely sound as well and I have to give a credit to Jah Bless (who also had an album through Zion High Productions in recent times, the very impressive "Redemption") (I knew I forgot someone) who plays a very subtle and infrequent yet STUNNING trombone on this song. If you listen for it, you'll notice that it comes in at precisely the perfect moment and adds so much to things, again, at least for me. The biblical 'Have Heard' is another tune giving praises to His Imperial Majesty and is probably about as straightforward as you'll get on the whole of "Livicated" as, essentially, the chanter gives a giant THANK YOU to HIM on behalf of himself and all of mankind. This is actually just as much a showcase of the actual music as it is for the work of Vaughn Benjamin. Compared to… pretty much everything else he does, 'Have Heard' is very airy and light and because of that not only are we particularly treated to the artist's typical genius, but the work of his fellow masterminds on the instruments who stand up with one of the most powerful compositions on the album. Because of that, it actually goes quite well with the song which comes in next, 'Faith'. I have had SO MUCH fun with 'Faith' and will continue to do so long after this review. By his standards, 'Faith' is another kind of 'open' tune from Benjamin, but this is one is… completely saturated in… something very, very special for me. TEARS! And, somewhat in retrospect, I don't know its equal. This is an artist who clearly makes his way with words, when he gets to the point when he can kind of back off of that aspect and STILL have a similar impact -- what happens there? Like I said, I'm still working on 'Faith' and I expect to be doing so for quite some time, but where it stands now represents, potentially, the greatest form of growth on the "Livicated" album, as it may go from being a great song into being a possible all-time personal classic for me. Winding down, "Livicated" continues to churn out legitimate winners beginning with 'Handle Sumptin', where Benjamin begins to wonder if you have your priorities in order. For all they can work"
There is yet another precious gem of a SMOOTH track supporting 'Handle Sumptin' and it clearly is not wasted in this moment as listeners are treated to a lyrical experience which, in full, rivals anything you'll find on this release. And, I should also say, that like the pair of tunes preceding it (and 'Daughtaz & Sunz') and, this one comes off effortlessly! A beautiful song! The emotional 'Eyelidz' is another one I had a great deal of fun with for several reasons - not the least of which is just how normal and relatable it is. If you live long enough and do it well enough, you'll encounter some difficult times that you must go through and things which're sure to have a significant impact on you, this a song about those things and how you react to them. Secondly, the mood of what is going on here, lyrically, melds so harmoniously with the music on the song, so what we get is this instance, so late on in the album and definitely not for the first time, where I'm still wondering if I just heard one of the best recent compositions from Akae Beka. 'Eyelidz' is magical. "Livicated" reaches its end with what has to be regarded as its changeup, 'Over Antichrist', a song I was well looking forward to hearing as soon as we saw the tracklist. What is different here is that should you go through most of the selections on this project, even some of the more enthused ones such as 'Firmness', the sound is very easy and immediately digestible, even in during complicated moments where you get these glowing combinations of smaller sounds. 'Over Antichrist' changes that with its large (by comparison) sound and dramatic piano (again, biggup Andrew Stoch) and it is a very welcomed and admirable change of pacing in my opinion. As you might expect, for his part Vaughn Benjamin produces a biblical master class, which is something he has been doing in different ways throughout his entire sterling career and this is probably one of the better pieces of its kind in that regard. And I'll also say that 'Over Antichrist', despite its immediacy, is still the type which requires a bit of time to grow, at least it did for me, but maybe I'm just not that bright. Overall, while you can question my own mental luster, I'm having a really difficult time doing it in reference to this set. When it comes to individual artists, I'd like to think that I judge them fairly, but do so in a category which is uniquely their own, which is obviously the case when it comes to artists I'm more familiar with. I say that to say: AFTER WRITING THREE OR FOUR DOZEN OF THESE THINGS, I THINK I MIGHT KNOW A GOOD AKAE BEKA/MIDNITE ALBUM WHEN I HEAR IT. Whether or not "Livicated" is any 'good' is not up for question, but I am thinking that it may be several levels ahead of that - right now. What's missing? I don't know. The argument could be made (and I'm going to make it right now), that it ranks, rather easily, as one of the best sounding albums from that vault. 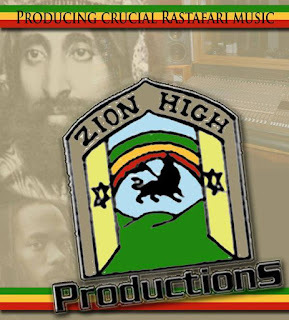 As I've said several times, a major credit goes to Zion High Productions, the Zion I Kings, all players of instruments and company because the music here is sensational throughout. I also want to mention that, despite featuring twelve selections (which is a pretty good number these days), "Livicated" is FULL. During nearly an hour's worth of music, it seems as if someone was of the same opinion as I am and made a point to allow the music the opportunity to shine as well as the vocal artist and after recently having albums which seemed to come and go too quickly for my tastes, that is not an issue here at all. Lyrically, the album also glows with the central theme rotating (as it always does) around His Imperial Majesty. Specifically, however, in this case many of the songs tend to deal with issues which are within the behaviour of people and how our actions and feelings can bring us closer to HIM. So, as I continue to attempt to qualify and quantify "Livicated", the latest from Akae Beka, I have to say that if there is something truly wrong with this album after more than 3800 words, I'm having a really hard time finding it. Excellent. Great review with some nice insights as always, gives me some new things to ponder while listening. I was a bit surprised at your interpretation of "Firmness" since to me, it seemed like this was one of the rare tracks with a very specific theme, namely, the contemporary African migrant/world refugee situation and their welcoming/rejection by Europeans. But I am guessing you intentionally chose to focus on the broader commentary on human endurance. Can't wait to get my paws on this one! Been listening to the living fyah. Hey man, thanks for this brilliant review. I've been a Midnite fan for years and continue to be so impressed with the work Vaughn (Akae Beka) is putting out. 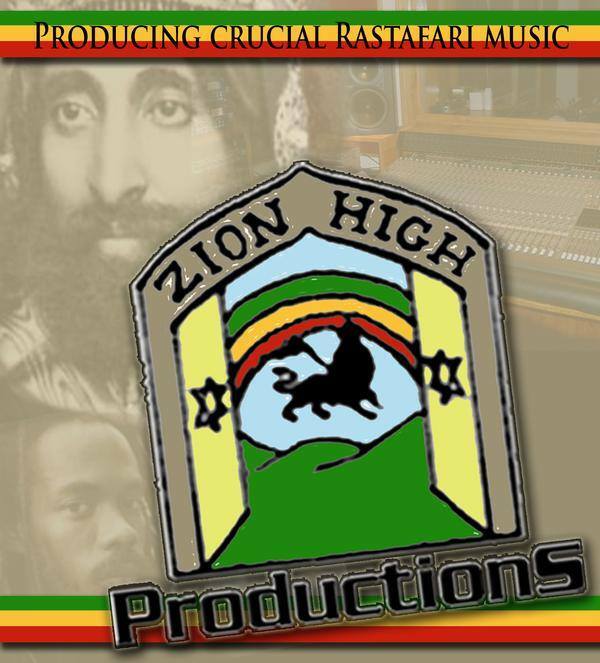 The family of Zion I Kings Productions produces, to me, the best roots reggae. So much else is just boiler plate reggae. That's why I keep coming back to Midnite/Akae Beka albums. It's also great to see that Akae Beka remains prolific, with great material, so I never have to wait long to get a great album. I add also that Beauty for Ashes was my favorite! "A Reminder" starts with such an energy, such a vibe, all the way through to "A Healing". "A Healing" appealed to me especially because of my field of study. I didn't think Beauty for Ashes could be topped. It's still my favorite but the subsequent albums have also been so good! Give thanks for this review!